This is not a definitive list of activities I am too apathetic to get involved with, in fact I completely reserve the right to contradict myself utterly by doing one/all of these things before my inevitable demise. 1) Watch Breaking Bad/Downton. If like me you have a twitter addiction, you cannot escape the impact these shows obviously have on people. I have never seen either of them. Downton just doesn’t appeal, and finding time to watch 5 series of Breaking Bad so I can have a two year late finale related epiphany sounds like hard work. I might read the Wiki synopsis one day, just so I can join in conversations about it…. 2) Climb high things/row long and tropical rivers/adventures in jungles. I am not built for adventures involving exercise. I am built for watching other people’s exotic journeys from the comfort of my own sofa. There are far too many bugs on many of these excursions, or not enough oxygen. Poisonous things, and lack of air to breathe make me think a place is not suitable for humans, especially this human. My adventures are more of the cocktail/new band/what happened last night?!? kind and that is enough for me. 3) Read War and Peace, despite being named after a character in it. This may well be because I looked the Sonya in question up on wikepedia once, and she sounds like a right loser, or it may just be because it is a big book, all full of long words and misery, and I don’t really think I care enough to devote the time to it. Also on the list of books I cannot be arsed to read is the Stieg Larsson Girl with etc trilogy. When I was working in a book shop, customers raved about them all day. And the more they raved, the more I felt it couldn’t possibly live up to the hype, and that the endless praise was turning me right off the idea. So I read a nice book about cheese instead, and have continued avoiding them ever since. 4) Twerk. I am a Twerk free zone. Ditto for laying down some Gangnam Style moves. Or even cracking out a bit of the old Whigfield Saturday Night routine. I am not completely adverse to the idea of Oops Upside Your Head-ing it, mostly because that happens sitting down. Now don’t get me wrong, I like a bit of a boogie, especially after a few booze drinks, but generally speaking I am more of a foot tapper, and when driven to move more than that, I opt for a free style move part way between Goth swirly hands and shoe gazer foot examining. The only dance routine you will ever see me attempt is the Prince Charming hands above your head thingum. Because if you are my age there is a law that insists you must. 5) Learn to crochet. Or knit. Or anything that involves knotting of thread in some way. I can barely manage a shoe lace. Now don’t get me wrong, I am an admirer of said crafts, and could be seen coveting some crocheted bunting as recently as yesterday, but I simply cannot be bothered to attempt to figure out how to do it, it would only result in me wrapping myself up in wool like a dyslexic spider. What stuff can’t you be bothered with? I’m with you on the housework. Also, mending the bathroom sink as Shaun cracked it. Hurrah. Uuuuuuhhhhhh! I haven’t watched either of those either and it seems like far too much effort to cath up! I any be bothered to read long books either and I love books! I have thrown a few gangnam style moves before that was fun but twerking? Nuh uh no chance! I evidently any be arsed to put photos and canvases up because two months on from house move in still knocking pictures over!! I am with you on Breaking Bad. Unless they put it on the telly rather than online of course. I obsessively watch Downton, but it is so annoying. This chocolate box world of kindly gentlefolk who treat their servants like family. I think it is the frocks I like as the politics are infuriating. I also want to slap miserable Lady Mary round the face everytime I see her. I cannot be bothered to make gourmet food or bake biscuits. I watch Great British Bake Off normally with a box of chocolate mini rolls, or an angel delight, thinking smugly that I bet their home made stuff isn’t going to taste nearly as good. Housework, urgh. I can’t be bothered to even care about it. Find a new boyfriend who probably would nag me to do housework and also complain about my obsession with Downton and the Great British Bake Off. My husband used to say I was castrating him by television. I think he meant America’s Next Top Model Though mainly. I have yet to meet anyone interesting enough to surrender the remote control to. You and me are pretty much cut from the same (non-knitted/ non-crocheted) cloth. I’m not up for dangerous adventure either. I watch Downton, but all these American series sound amazing but I just don’t have the staying power/ time for them. I DO highly recommend The Girl Who series – they are genuinely amazing. I wasn’t sure they would live up to the hype either. 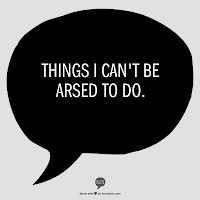 But housework/ crocheting/ twerking… Sod ’em all. Life’s too short. We were separated at birth. MIind you I am adopted and my birth mum had loads of kids so you never know lol. Totally. Except I did read War and Peace when I was “cough” young when my parents bribed me (and I actually enjoyed it…. Loving the dance rules re obligatory moves! I would add Don’t Do Ironing – please. Life is too too short. If necessary buy clothes that don’t crease! As for those who iron their underwear……. I have nothing more to say! Fabulous Sonya and I have to say, I’m with you on every single one of these…..there are too many things i can’t be arsed to do, to even know where to start! This would make a fabulous meme though. I can’t be arsed to cook tea tonight as hubbie is away,so me & the kids are having a “anything-you-can-find-in-the-freezer” night! I’m with you on most of the other stuff too.